Archpriest Joseph Martin, retired Dean of Holy Resurrection Cathedral, Wilkes-Barre, PA, fell asleep in the Lord on Friday, November 9, 2018 at the Penn Presbyterian Medical Center after a brief illness. 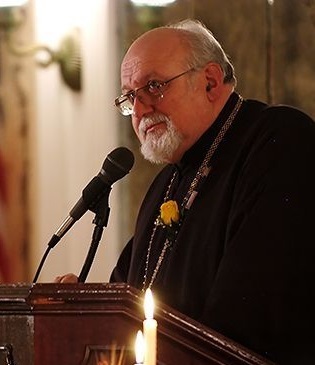 Born in Frackville, PA on Holy Pascha, April 5, 1942, the son of the late Joseph and Anna Martin, he was a 1963 graduate of Saint Tikhon’s Orthodox Theological Seminary, South Canaan, PA. He married the former Gloria Matechak on October 16, 1965. He was ordained to the priesthood by His Grace, Bishop [later Archbishop] Kiprian on November 7, 1965, after which he served Holy Trinity Church, McAdoo, PA for 29 1/2 years while also serving parishes in Shenandoah, Saint Clair, Minersville, and Mount Carmel, PA. In 1995, he was assigned Dean of Holy Resurrection Cathedral, from which he retired in 2014. The following year, he celebrated the 50th Anniversary of his ordination. In addition to his wife, Matushka Gloria, Father Joseph is survived by his daughters Cathryn [Dr. John] Haber, Tresckow, PA; Juliana [Jeffrey] Good, Hellertown, PA; Marina Martin and her fiancé James Turnbach, Conyngham, PA; Deborah [Judd] Good, Hellertown, PA; eight grandchildren: Elena, Alex, Andrew, Anna, Aaron, Kyra, Stephen and Sara; brothers Melvin, David, and Paul; and many nieces, nephews, and great nieces and great nephews. In addition to his parents, he was preceded in death by his brother Frederick. In addition to his parish duties, Father Joseph served in various of capacities in the Diocese of Philadelphia and Eastern Pennsylvania, including Dean of the Frackville Deanery. He was the longest continuously serving Board Member of Saint Tikhon’s Orthodox Theological Seminary and its Century Association and was active in the Fellowship of Orthodox Christians in America [FOCA]. At the time of his repose, he served as Chief of Chaplains at the Wilkes-Barre Veterans Medical Center. His community activities included serving as past Chaplain of the McAdoo Fire Company and the McAdoo Lions Club. He also was a founding member and Past President of the Wilkes- Barre Lions Club and Chaplain and Past District Governor of Lions District 14W. Visitation will begin at Holy Resurrection Cathedral, Wilkes-Barre, PA at 4:00 p.m.on Friday, November 16. The Lions Club will gather at 4:30 p.m. The Funeral Service for a Priest will commence at 7:00 p.m. On Saturday, November 17, the Divine Liturgy and Panikhida will be celebrated at 9:00 a.m. at the Monastery Church of Saint Tikhon of Zadonsk, South Canaan, PA. Interment will follow in the monastery cemetery. His Beatitude, Metropolitan Tikhon will preside at the services. In Lieu of flowers, donations may be sent to the Very Rev. Joseph Martin Memorial Scholarship Fund, c/o Saint Tikhon’s Orthodox Theological Seminary , PO Box 130, South Canaan PA 18459. May Father Joseph’s memory be eternal!